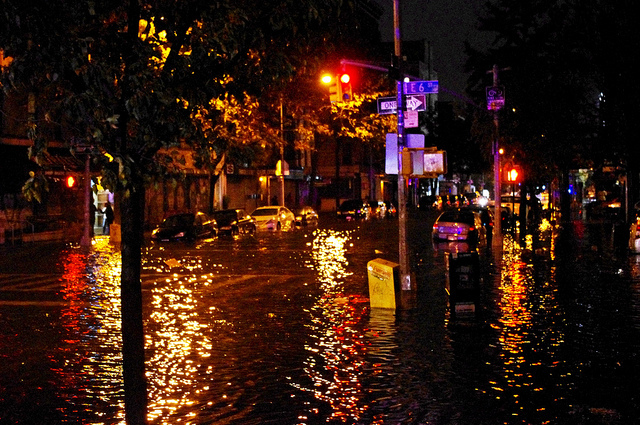 Flooding during Hurricane Sandy. Photo courtesy of David Shankbone via Flickr. Between 2011 and 2012, three hurricanes struck New York City, seriously damaging the city’s coasts. For example, Hurricane Sandy caused $19 billion in damage, left 2 million people without power, and flooded 17% of the city’s land mass. Moreover, 1.1 million children were unable to attend school, and there were 44 fatalities. Jaime Torres-Springer, Partner at HR&A, today explained the urgent need to build a more resilient New York. Storms like these are becoming more and more intense and it is increasingly difficult to cover the costs. The New York City Panel on Climate Change Projections (NPCC) expects the number of residents and buildings in the city to double by 2050. The NPCC forecasts an increase in average temperature and annual precipitation. It is also expected that the sea level will rise 1-2 ft. Given these projections, the Big Apple must protect itself through resiliency initiatives. Currently there are some programs designed to improve the city’s resilience. These include initiatives such as adapting public and private buildings to withstand impacts of climate change, adopting new land use policies, and mitigating the risk of heat through nature-based strategies.